Dr. Stone injured his own knee playing soccer at Harvard. The surgeon removed this meniscus. Dr. Stone's quest to find a replacment started when he was out for a run with his mentor Dr. Richard Steadman who suggested that if he could find a replacement he would make a significant contribution to orthopaedics. Stone spent the next few years as an orthopedic surgery resident collecting and reading research on the meniscus cartilage at the Countway Library at Harvard. He gave lectures at Thermedics and Dupont and talked with their scientists searching for artificial materials that might replace the role of the meniscus in the knee. 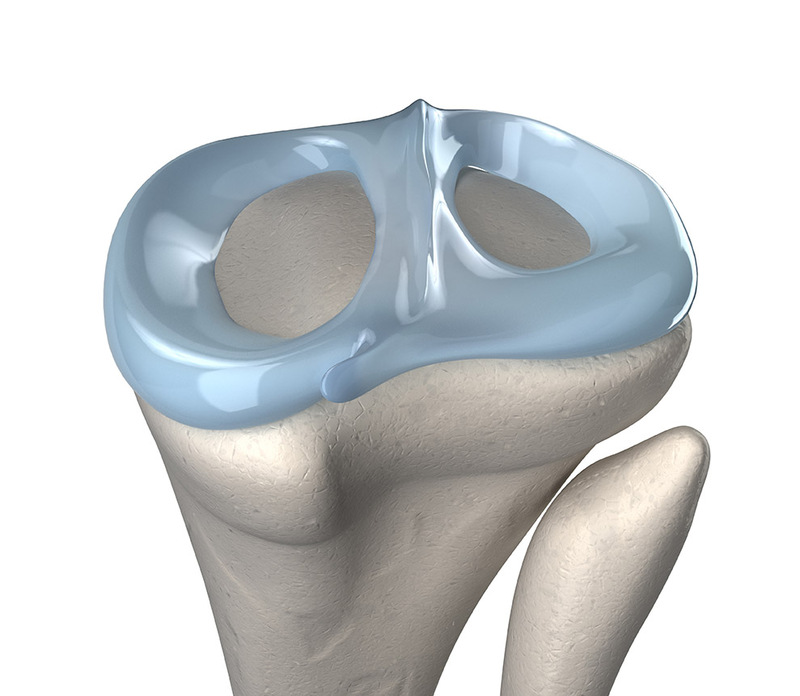 However, since the knee goes through 2 – 3 million cycles per year and the cartilage covering the end of the bones is up to five times as slick as ice-on-ice, there is no material known to man that is soft enough, strong enough, and with a low enough friction to go into the knee joint between these surfaces and not damage healthy articular cartilage. In 1986, while doing a research fellowship at the Hospital for Special Surgery, he shifted from replacing the meniscus to a concept of regrowing the meniscus. He turned to a collagen scaffold developed for hemostasis and a crosslinking technology by Ioannis Yannas, PhD, a professor of mechanical and biological engineering at MIT used for skin grafting and decided that since the meniscus (and the whole body) is made of collagen, this could be the best material to use for a regeneration template. Dr. Stone designed a collagen scaffold cross-linked with glycosaminoglycans for the repair of the meniscus. He contracted with Shu-Tung Li, PhD, at American BioMaterials Company to build a collagen scaffold according to a custom design by Dr. Stone loaded with glycosaminoglycans in a similar manner to the meniscus as a possible meniscus cartilage regeneration template. Dr. Stone traveled to South Lake Tahoe, California for a clinical knee fellowship with Dr. Richard Steadman. During that time, Dr. Stone wrote a grant to the Letterman Institute for research to fund animal trials of the collagen scaffold. He collaborated with Bill Rodkey, Phil Bowman, Richard Weber, and LuAnn McDermot to conduct a series of studies in tissue culture and animals demonstrating the efficacy of the collagen scaffold for regrowing meniscus cartilage as well as the intervertebral discs for goats. This research and subsequent publications was awarded the Albert Trillat Young Investigators award from the International Society of the Knee in 1989 and the Cabaud Research Award for meniscal regeneration using co-polymeric collagen scaffolds by the American Society of Orthopedics Sports Medicine in 1990. Dr. Stone later formed a company called ReGen Biologics and conducted an FDA-approved human clinical trial at The Stone Clinic in San Francisco, CA. This was the first human clinical trial of regeneration templates for tissue engineering inside the body. It was designed to re-grow the meniscus cartilage through the regeneration template his team had constructed and received several United States patents for this work. The clinical trial of the collagen meniscus implant and subsequent follow on testing in the United States and around the world led to U.S. and European approval of the collagen scaffold for use in humans. Collagen meniscus implants have now been used to regenerate meniscus cartilage in over 4,000 knees. Unfortunately, despite no known complications associated with the implant, the FDA later rescinded U.S. approval. The device, now named Menaflex is available in Europe. We hypothesize that treatment of avascular segmental meniscal defects in sheep with cell-seeded allogeneic meniscal tissue is superior to partial meniscectomy or treatment with non-seeded allogeneic meniscal tissue alone in terms of the type of the repair tissue in the defect. Sheep (n = 15) will be anesthetized and exposure of the medial joint compartment will be achieved by a medial parapatellar arthrotomy. A 6-mm circular punch defect will be created in the avascular portion of the anterior horn of the medial meniscus of each limb. 6-mm circular plugs will be acquired from the allograft meniscus, taking care to match the surface contour of the explanted punch. “Cell-seeded” meniscus plugs will be vacuum infused with cells from a bone marrow derived stem cells preparation. The in-life period will be 12 weeks. To understand the reasons for graft failure that were treated by revision meniscus allograft transplantation and to examine the long-term clinical outcomes of these same patients. Meniscus transplantation in an active population with moderate to severe cartilage damage. Stone, KR, Pelsis, JR, Surrette, ST, Walgenbach, AW, & Turek, TJ (2014). Knee Surg Sports Traumatol Arthrosc. PURPOSE: The purpose of this study was to evaluate the efficacy of meniscus allograft transplantation in an active patient population with moderate to severe cartilage damage and the procedure's ability to allow sports participation postoperatively. METHODS: Forty-nine patients with moderate to severe cartilage damage who underwent meniscus allograft transplantation were included in this study; those with symptoms related to articular cartilage damage also underwent articular cartilage repair. Kaplan-Meier (KM) survival estimate, potential hazards to survival, and subjective clinical outcomes were analyzed. For KM survival, failure was defined as progression to knee arthroplasty, surgical removal of the meniscus transplant without revision, a self-reported follow-up pain level that was more than preoperative level, or constant moderate pain with no relief from non-operative treatment. RESULTS: The mean follow-up time was 8.6 ± 4.2 years. The mean age at surgery was 45.3 ± 12.9 years. Meniscus transplantation was performed in 37 medial cases and 12 lateral cases. There were 41 patients with Outerbridge Grade IV and 8 with Grade III. Thirty-six (73.5 %) patients were able to participate in sporting activities postoperatively. Eleven (22.4 %) meniscus transplants failed at an average of 5.2 ± 4.4 years. The KM mean estimated survival time was 12.6 ± 0.7 years. No tested risks were found to affect sports participation or procedure success. CONCLUSIONS: Meniscus transplantation is a viable surgical option for patients with severe cartilage damage and missing or irreparable menisci to provide significant improvements in pain and function levels in the medium to long term with the majority of patients achieving their goal of participation in sporting activities. These results indicate that symptomatic patients may be able to participate in sports activities for an average of 12.6 years following meniscus transplantation. LEVEL OF EVIDENCE: Case series, Level IV. Long-term survival of concurrent meniscus allograft transplantation and articular cartilage repair: A Prospective Two- To 12-Year Follow-Up Report. J Bone Joint Surg Br 92-B(7): 941-948. Stone K.R., Adelson W.S., Pelsis J.R., Walgenbach A.W., Turek T.J. 2010. Meniscus reconstruction: the new field of rebuilding meniscus cartilage. Stone KR, Pelsis JR, Adelson, WS, Walgenbach, AW. Knee Surgery, Arthroscopy, Sport Traumatology, 7(3): 9 – 18, 2010. Meniscal Sizing Based on Gender, Height, and Weight. Stone KR, Freyer A, Turek T, Walgenbach AW. Arthroscopy: The Journal of Arthroscopic and Related Surgery. May 2007:23(5):503-8. Lessons Learned From Our First 100 Meniscus Allograft Transplants in Arthritic Knees. Stone KR, Walgenbach AW, Freyer A. Musculoskeletal Tissue Regeneration: Biological Materials and Methods, Humana Press, In press. Meniscus Allograft Survival in Patients with Moderate to Severe Unicompartmental Arthritis: A 2- to 7-Year Follow-up. Stone KR, Walgenbach AW, Turek TJ, Freyer A, Hill M. Arthroscopy: The Journal of Arthroscopic and Related Surgery, Vol 22, No 5 (May), 2006: pp 469-478. Meniscal Allografting: The Three-Tunnel Technique. Stone KR, Walgenbach AW. Arthroscopy: The Journal of Arthroscopic and Related Surgery, April 2003. Meniscus Regeneration by Collagen Meniscus Scaffolding. Stone KR. Surgery of the Knee-Third Edition, Insall JN, Scott WN, 2001. New Techniques for Cartilage Repair and Replacement. Stone KR, Mullin MJ. Knee Ligament Rehabilitation, Ellenbecker TS, June 2000. Current and Future Directions for Meniscus Repair and Replacement. Stone KR. Clinical Orthopaedics, 367:S273-280, October 1999. Meniscus Replacement. Stone KR. Clinics in Sports Medicine, Vol. 15, No 3, pg. 557-571, July 1996. "Substantially Non-Immunogenic Injectable Collagen." US Patent 7,064,187 B2. Issued June 20, 2006. "Substantially Non-Immunogenic Injectable Collagen." US Patent Application Publication. US 2004/0192603 A1. Issued September 30, 2004. "Meniscal Heterografts." US Patent # 6,093,204. Issued July 25, 2000. "Meniscal Xenografts." US Patent # 6,046,379. Issued April 4, 2000. "Meniscal Augmentation Device." US Patent # 6,042,610. Issued March 28, 2000. "Osteotomy Wedge Device, Kit and Methods for Realignment of a Varus Angulated Knee." US Patent # 6,008,433. Issued December 28, 1999. "Meniscal Xenografts." US Patent # 5,984,858. Issued November 16, 1999. "Substantially Native Meniscal Cartilage Heterografts." US Patent # 5,913,900. Issued June 22, 1999. "Technique for Osteocartilaginous Transplantation in a Mammalian Joint." US Patent # 5,881,733. Issued March 16, 1999. "Meniscal Heterografts." US Patent # 5,865,849. Issued February 2, 1999. "Suture Anchor Assembly." US Patent # 5,824,011. Issued October 20, 1998. "Meniscal Augmentation Device." US Patent # 5,735,903. Issued April 7, 1998. "Meniscal Augmentation Device." US Patent # 5,681,353. Issued October 28, 1997. "Prosthetic Meniscus." US Patent # 5,158,574. Issued October 27, 1992. "Prosthetic Meniscus." US Patent # 5,116,374. Issued May 26, 1992. "Prosthetic Meniscus." US Patent # 5,007,934. Issued April 16, 1991.